The Laughing Cow, a joyful cheese, has often orchestrated the snacks back from school. Synonymous with cheerfulness, it has integrated the spirit of children with her smile and her cheese-shaped earrings. 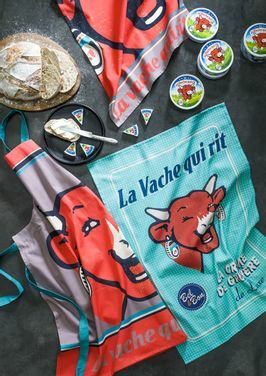 Towels and aprons, 100% cotton printed or jacquard, bring out this atypical and joyous side of the image offered by The Laughing Cow.